BOO! AAAAAAHHHHH! The scream of an innocent boy flew past me. Mwah hahahaha! It was October 31st, Halloween night!! My friend and I were planning on scaring people as they came to get candy at our doorstep. I was dressed as a vampire for Halloween, but to scare people I wore my friend’s screamer mask. The plan was to sit on the bench as still as a rock. We had to look like decorations. And just as kids came up next to us… BOO!!!!!!!! I sat on the bench. My friend would signal to me when a kid was close so I would know. Suddenly, I saw a group of middle-schoolers walking towards us. I thought it was hopeless – how would we scare kids older than us. It was worth a try though. I sat as still as a statue. As the kids climbed the steps, they saw me on the bench. One girl said “Is that a person or a decoration?” Another kid responded “It’s a decoration!” Hahaha, I thought. They will sure find out what it is. Just as they were about to go past me I got up abruptly and yelled AAAAAARARRRGGGGHHHHH!!!!! “AAAAAHHHHHHH,” the middle schoolers went falling back in fright. Some girls even ran away without taking the candy. We all laughed like happy goblins!! I sat down on the bench again. This time we saw a group of high schoolers approaching. I was having second thoughts about doing it to older kids. Well I did it anyway. I saw the kids climb the stairs. As they stared at me, I didn’t know what to do. So I sat still as a rock, hardly breathing. Just as they moved I went AARRRRRGGGGGHHHHH!!!!!!!!!!! What!!? Nobody jumped back surprised? One kid pulled off my mask laughing at my failed attempt! Oh well, sad for me! I gave them candy and they left. I wanted to get revenge on them so bad because I heard them talking to some other kids that we were going to try to scare them. Our plan failed that time as well. It was a fun Halloween! I had more fun scaring people than trick or treating. BEWARE: If you see someone in a screamer mask next year, who knows? It might be me trying to get you as my next victim. This is the first narrative I have written in 5th Grade, about my first Taekwondo class! Calm down, focus and concentrate I told myself. “Harveer, try harder!” Master Kim told me. “Kick center of board!” Master Kim exclaimed in a stern voice. “Hiyaaaa! Crack, OOOOOOO WWWW my foot!” I shouted. “I’m doomed!” I thought in pain. I was entering the Taekwondo room. The room was so motivational, I was really pumped up. When I got on the mat I bowed and entered. I went straight to Master Kim. “Say, Excellent Sir!” he told me. I was frightened to know that everybody was more advanced than me. I only had a white belt while all the other kids had jaundiced-looking, yellow-green, and a white with a green tape belts. “Yes Sir!” everybody replied obediently in unison. I was so confused. I didn’t even know how to do meditation. I felt left out because everybody was meditating and I was just sitting there doing nothing. After a while, I figured it out and sat criss-cross applesauce, with my hands on my knees. “Yes sir!” we responded quickly! He told us it was time for board breaking. I was so confused. Was board breaking, breaking wood or what? I even got up because I thought board breaking was kicking, which it was, but right now it wasn’t my turn. Everybody laughed and I got so embarrassed I sat down as fast as a cheetah. I asked someone next to me what Master Kim meant by board breaking and he told me that we would be breaking a wooden board. I was so scared that I thought I was going to faint. First went the white belts. Abruptly, I realized I was a white belt! I let the other white belt kid go first. He went and got 2 turns. He missed. This made me even more nervous. “Harveer, you’re next!” Master Kim said in a way that gave me more confidence! My heart went, THUMP, THUMP, THUMP, THUMP, THUMP. I was so terrified and by the look on Master Kim’s face, I realized he knew I was. I was shivering with fright. This was because I felt like there were a million people around me watching, but there were only about 20! Master Kim gave me confidence by telling me that I would do perfectly fine. I thought what everybody would say if I couldn’t break the board. Finally, I gathered enough strength and courage. I ran up and kicked the board with all my might! I missed. I felt a mixture of different emotions. I was mad I didn’t break the board and sad for the same reason. The board had broken! I felt such a great amount of accomplishment! Master Kim shouted happily ” Well done Harveer! 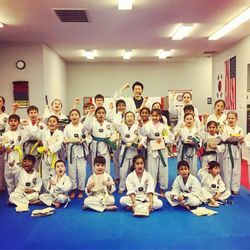 Everybody a round of applause for Harveer!” By the look on Master Kim’s face, I could tell that he was proud to have a student that could break a board on his first class. After this incident, I went back to my seat, and thought about all of the great things I had learned today. Meditating, kicking, punching, and board breaking. I thought about how good I would be in 3 months from now at Taekwondo. I soon realized why my parents wanted me to join when I was younger. They wanted me to have a self-confident, and strong personality. I knew I had found something that I would love to do! Hellooooo! This is my very own blog! I will be sharing all of my personal experiences on this blog. I will write at least 1 thing every week! Please come and check every week to see new experiences I have written about!